Autonomous road vehicles are attracting a lot of interest and investment these days. It’s fair to predict that both the public discussion and the flows of money will keep growing. Attention is focused mainly on autonomous vehicles for passengers (think Google car, Tesla Autopilot) and automated road freight transport (think truck platooning, Otto). Availability of those vehicles will lead to disruptive change in two other domains: private mobility on the one hand and professional transport services on the other. The profound technological change implied by autonomous driving will inspire radical innovations in the way vehicles are used – as happened with phones, which have become much more than just devices to make calls since they became mobile. This innovation happens like a wave that feeds on itself until mature usage patterns emerge after something like 10 or 15 years. We must humbly recognise that nobody can claim today to have a clear vision of what those usages will be in one or two decades. But that shouldn’t stop us of thinking boldly today about what might happen. Personally, I believe that itinerant services will be a new important usage area for autonomous vehicles. Such itinerant services were very popular in the 1950s and 60s in many countries, particularly with libraries. Those vans were serving areas that had few or no public libraries or bookshops, but still had many potential interested readers. I was an intensive user of a library van during my summer holidays for some years and have fond memory of the value it provided in terms of access to varied reading. Post offices or banks on wheels as well as rolling points-of-sale for vegetables or clothes were also common in many regions, and sometimes still are. Recently, this phenomenon has seen something of a revival with the appearance of food trucks that bring high-end cuisine literally to the streets of hip urban quarters – in principle a modern, upmarket take on the Kebab or ice cream vans of yonder. Automated vehicle will create a real opportunity for the resurgence of itinerant services, I believe. There seems to be a particularly strong case for them where the self-driving vehicle can provide some form of sophisticated equipment to which clients otherwise would have to travel. The most obvious examples that come to mind are in the health sector. The collection of medical samples for diagnostics purposes, for instance, could probably be organised with specialised self-driving vehicles, very likely with remote human support from a medical professional. Vehicle autonomy not only reduces the cost of provision of those itinerant services and makes them more accessible to its users. Self-driving vehicles also make it much easier to change locations during off hours – during night time or on public holidays, say. Entrepreneurial spirit, associated with technological innovations in other sectors than transport will have a quite field to explore. The whole field of “experiencing”, presently a key target of the travel industry, comes to mind in association with virtual reality and possibly differentiated catering evoking the places thus visited. sophisticated services that currently can only be accessed in more time consuming and often costly ways to people everywhere. The space of opportunity for business innovation is clearly there. So my bet is that we will see the re-emergence of itinerant services, but possibly on a much larger scale and with greater variety than the good, old fashioned library on wheels I knew. Unlike my bookish van, which returned to its depot in the evening and left from there again the next morning (with a good night’s sleep for the driver in between), the trips of a self-driving itinerant service will no longer have a clear origin or destination. It will be forever circling around, with “destinations” simply a succession of events along the way. Some of its functions could probably be performed without even stopping. From a transport policy perspective, this will be a more efficient and less travel-intensive way of providing certain services. For other business models, this approach will generate new markets and probably additional vehicle kilometres on the road. What the combined effect of all this will be nobody can say. What we can say is that autonomous vehicles will spawn new forms of mobility, and that it will pay off to carefully monitor this development – to spot new business opportunities, but ultimately also to enable them to thrive in a transport system that is efficient, safe, user-friendly, not only once we reach a future steady state, but throughout the radical transformation transport is entering. Are we going to be comfortable letting go of the steering wheel? Many car makers and technology companies are betting on it. A flurry of recent announcements is predicting that driverless cars and taxis will be on our cities streets within five years. Uber just began a pilot of self-driving taxis in Pittsburgh, Tesla’s latest business plan clearly targets “fully self-driving” vehicles, and Ford is gearing up for mass market driverless car production by 2021. Much less media attention has been devoted to a related issue: the possibility that driverless trucks will soon be roaming our roads. For this scenario the key question is a slightly different one: Are we ready to share the roads with dozens of tonnes of steel when there is no human in charge? Once it becomes available, the operating flexibility and cost reductions from driverless operations offer trucking companies and their customers a strong carrot for its adoption. The International Transport Forum estimates that on long-distance routes driverless trucks could be operated with a cost advantage of 30% or more compared to conventional manned trucks. The advantages for hauliers are obvious: Drivers represent the biggest chunk of operational costs and at the same time a constraint on using trucks at full capacity – they do need breaks to rest, after all. Taking humans from the cabin means trucks could operate all day and night without having to stop, except for refuelling. There are many issues that need to be solved before driverless technology can be cleared for use on public roads. Some are technical and need to be resolved by engineers and computer scientists. Others are public policy issues: Governments need to make the call as to when the machines can take over. This involves deciding how and when driverless truck systems demonstrate lower (real and perceived) risks of crashes than the current situation with humans doing the driving – and especially that they do not fail in situations that humans would normally handle well. No driving system can ever be 100 per cent safe, whether humans or computerised systems are in charge. But in well-defined situations – for instance on motorways, where there is no crossing traffic and speeds are similar – automation technology may soon safely handle driving tasks for 99.9% or even 99.99% of driving time. But can there be a clear-cut percentage or success rate for allowing operation without a driver in the cabin that would satisfy the safety concerns of regulators (or of road users, for that matter)? In the United States, the National Highway Traffic Safety Administration recently published guidelines on automated vehicles. These provide an early indication about how it will judge when the machines are ready to take over. The US approach appears to be that driverless vehicle developers will be required to set out clearly how their vehicles respond to given situations (such as a loss of communications) and how they comply with each road rule. Yet accepting robot trucks is not solely about rule compliance and crash probabilities. It also has a highly subjective dimension. That humans systematically overestimate their own driving skills is a well-documented fact. The result of this, among other factors, is 1.25 million road deaths every year on the world’s roads. Objectively, machines will probably be able to do better soon. Yet public acceptance may well depend more on how people would feel if they heard on the news that a 32-tonne semi-trailer with no human driver in the cabin had been involved in a fatal crash. Regardless of the actual crash performance of driverless trucks, the idea might well be scuttled if the public’s perception is dominated by unease, fed by rare but highly publicised crashes. It is thus worth thinking about ways to move towards driverless trucks and the benefits they provide while reassuring the community that machines haven’t taken over. Three options warrant consideration. The first is so-called platooning. In a truck platoon, several vehicles form a closely-spaced convoy in which only the lead truck has a human driver who navigates traffic. The following trucks are linked to the lead truck by wireless data links and automatically maintain a safe distance with the vehicle in front. If the trailing vehicles were allowed to operate without driver, quite significant cost savings would be possible. Although platooning has received a great deal of attention, e.g. from the European Union, the need to co-ordinate drivers and vehicles may make it less attractive than fully automated driving. Controlling “centipede” configurations of vehicles will also introduce new challenges for truck drivers as well as the other drivers on the same road. A second transition option is that of part-time human control: Drivers remain obligatory on all trucks, but their role is reduced to taking over from computerised systems when unexpectedly difficult driving situations arise. Such passive driving technology is well-advanced: Truck manufacturer Daimler is testing driver-assisted automated trucks on the highways of Nevada in the US. This will help build experience with autonomous driving, yet the approach also has its limitations. Most importantly, the hand-over between machine and human is particularly risky. The driver still needs to pay full attention and be ready to act at all times – so while his task may be less strenuous, he will still need rest. With machines in charge most of the time, there is of course the risk the driver will not always be ready to take over quickly enough. Not least, the need to have drivers on board means there is no significant reduction of operating costs, making this option less attractive to hauliers. A third option is remote driving. Imagine control rooms where professional drivers are set up in a cabin-like environment that closely mimics the information and tools available in a real truck. 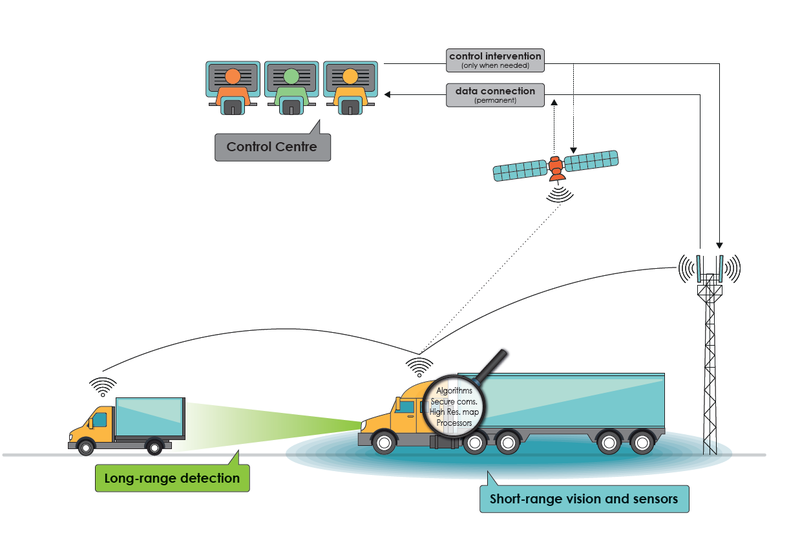 These drivers would remotely monitor and control a number of otherwise self-driving trucks and intervene, taking manual control of steering, indicating, accelerating and braking, when and where needed. The relatively low complexity of driving on a motorway would make it possible to operate a fleet of trucks with a much lower number of drivers than that of the trucks under their control. What sounds like science-fiction is already being tested in the real world, albeit in different contexts. Drones are just the most obvious example: the US Navy is currently in advanced tests of a remotely controlled fighter jet. In maritime shipping, Rolls Royce is working on freight ships controlled from land. In Australia, enormous trucks operating in the iron ore mines of Western Australia are being controlled by drivers in a centre 1 200 kilometres away. In the Netherlands, the remote control room approach is being used for the operation of low-speed driverless WEpod minibuses that operate on the five-kilometre route between the University of Wageningen and the city of Ede. And an Estonian firm is testing small robot vehicles for urban delivery in Washington, London and Hamburg that will be overseen from a control room in Tallinn, thousands of kilometres away. Driving from a control room has obvious advantages. For the driver, trucking becomes a regular office job similar to that of an air traffic controller. Rather than having to sleep in the truck cabin somewhere in a parking area with no facilities, he can go home to the family at the end of the day. Compared to full automation, the remote driving approach also ensures some continuity of skills, as the best truck drivers redeploy to control centres that offer more stable and comfortable job conditions. In the control room, remote drivers would be alerted by the on-board systems when difficult situations arise on road in which computers perform less well than humans – such as bad weather that hampers sensors, or ambiguous situations a computer cannot easily adjudicate. Initially, the threshold for human intervention would be set low, but with growing experience and self-learning systems it could be raised to a level where the control centre steps in less and less. A control room (perhaps owned by a truck manufacturer) could begin trials with a high ratio of drivers to trucks, even one-to-one. It would collect data (and share it with the regulator) on how often and under what circumstances drivers have to take over (and how often this occurs simultaneously). If the data shows that interventions from the control centre are sufficiently rare, its operator could gain regulatory approval to gradually bring more trucks under the control of each remote fall-back driver, depending on the risk aversion of the regulator. Finally, remote controlling does not require the co-ordination of trucks as in the platooning approach; it could be operated anywhere with suitable communications coverage. This raises the challenge for control room operators: They will need to invest in the facilities, on-board systems and communication technology necessary to support remote interventions in a given area. As one-to-one remote operation would not be profitable (but a likely first step), investors would need to be confident that regulators will allow higher truck/driver ratios once safe performance has been demonstrated. But for vehicle manufacturers, the investment as such is easily within their means. And given the cost reduction and performance increase they would offer, the potential demand for remote-controlled trucks is evident. The control centre model for driverless trucking on motorways seems to be a feasible path towards fully-automated trucks. It would also be directly applicable to other areas currently relying on professional drivers, such as taxis and buses. The significant cost savings would be attractive to operators, while the availability of drivers as a fall back in case of system failures could allay concerns about giving full responsibility to a robot. If we knew that a highly skilled human driver was always ready at a moment’s notice to take control of the vehicle, wouldn’t we be more willing to share the road with it?